Be on the scrolling leader board you see on our home page, calendar pages, business directory and membership application pages. Ads are linked to your site and mobile friendly. Reach over 4,000 views monthly, only 3 spots per month sold! 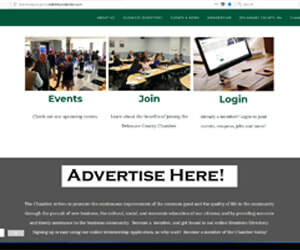 For a limited time, advertising prices for the NEW website will stay at the old prices. Contact Jessica Hoffman for full details and package options. Reach 4,500+ emails with exclusive advertising in our popular & expected weekly email blasts. Your logo and ad will be featured in a four-week run of the memo during a month of your choice (pending availability). We feature only one advertiser a month, o you are sure to be noticed! This eBlast campaign is sent on the first Thursday (holiday depending) of every month to the same 4,500+ contact list as the MMM. Members focus on events, coupons and discounts to share and build brand awareness on a specific offer or event. Pick a month of your choice, only eight banners sold each month! This is an option for members who want to get the word out about any news, events or special offers they want to share with a specific area or industry. Only two targeted blasts are sent per month! Stand out in the crowd and be the very first business new members notice! There is a new member orientation held four times a year, January, April, July and October, and at each orientation each new member is hand delivered a "Welcome to The Chamber Folder." Members now have the opportunity to provide promotional materials to the chamber that will be placed in 100 new member folders. All members are invited to sponsor any event, that includes being the host too! Let's celebrate your grand opening or just showcase your location to fellow members. The Chamber promotes your venue and the event in all Member communications and handles registration for you. Most events are held Tuesday through Thursday, and every host gets a list of attendees after the event. Sponsor a signature event or a series of events. Check out all we have to offer in our 2019 Sponsorship Package. Everything here is customizable to fit your needs. Questions? Contact Jessica Hoffman to discuss your needs and come up with a Chamber marketing plan.